Yesterday was a sea day which was lovely as a quiet space to sun, swim, have a massage (! ), and watch the waves go by from the balcony. The only trouble was that the ship clearly thought we needed to be amused on a long day at sea, and they staged a huge lunch buffet. In general, this isn’t one of those cruises where you are constantly lining up for food — the restaurants are very good, the food is lovely and the portions are reasonable and satisfying. This lunch buffet though was designed to encourage self indulgence and I fell into the trap. After showing restraint through all the gorgeous salads, cold appetizers, cheeses and entrees, I got into serious trouble amid the baked Alaska, the apricot tart and the croquembouche. Serious trouble. By evening I still couldn’t think about eating anything very much so we stayed in the room and I had spaghetti with tomato sauce (my go-to comfort food for whatever ails me) and Jer had a really great looking cheeseburger and fries. Then I let the ship rock me to sleep and when I woke up this morning and took a long walk around the upper decks, there was Sicily visible in the haze, with Mt. Etna rising into the clouds. Very, very cool. The city we docked at is Catania, which I had never had never heard of and still don’t know much about except that it has apparently been buried in lava something like 17 times, courtesy of Etna. It is an old, southern Italian city, both gritty and beautiful. It was blazing hot so we just planned to go to town, take a walk and have lunch at a place a local woman recommended in the middle of the fish market. The fish market is the real deal — bustling and wet underfoot with that briny eau de poisson aroma. 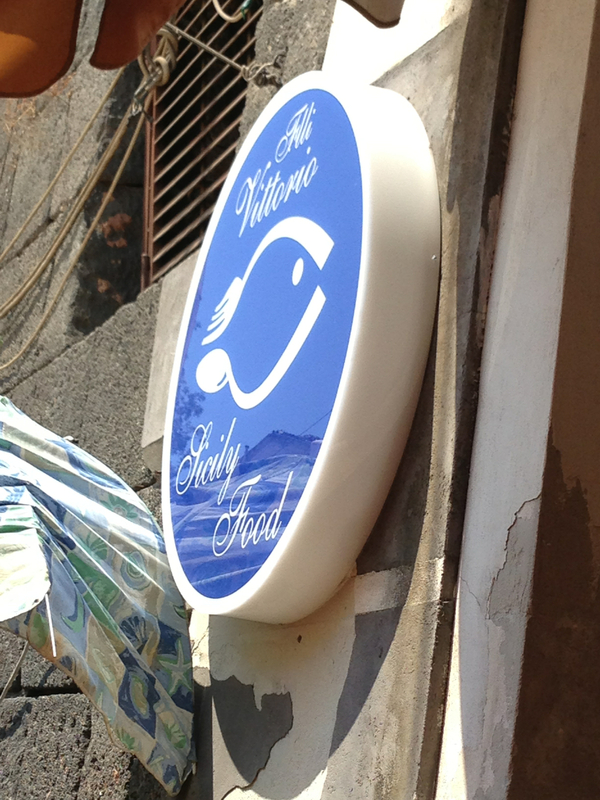 Trattoria Fratelli Vittorio, which took some finding, is an offshoot of a family fish mongering business. One of the brothers decided to put in a tiny kitchen and a few tables and that’s pretty much it. No English (or not very much) and no menu — you just go pick out the fish or shellfish you want and they ask if you want it fried (which means sautéed in olive oil, garlic, and lemon) or raw. So. The owner poured Jerry a glass of white wine and ran out and bought me a “coke light” from a store next door. We started with a couple of the most enormous oysters I have ever seen and a couple of fat scallops, all raw. Jerry ate those. I had a huge plate of shrimp and they were sensational. 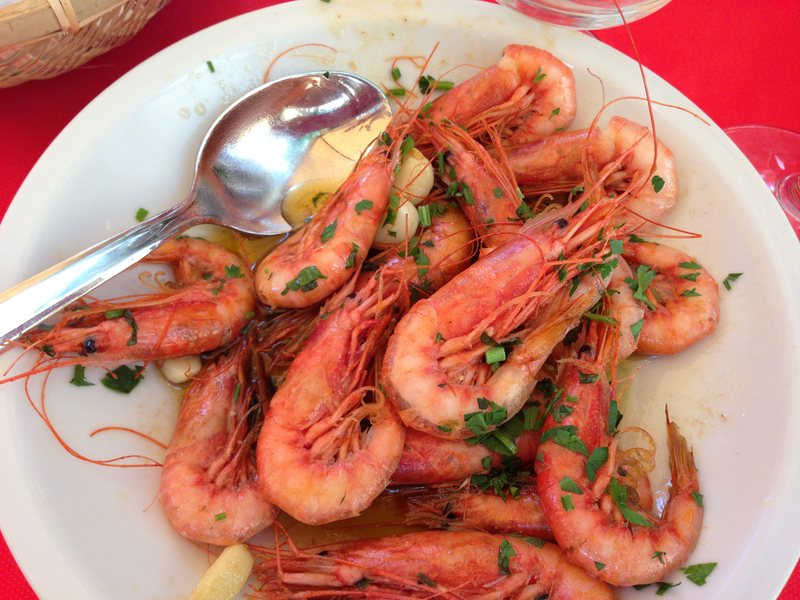 I am used to big fat briny gulf shrimp but these were small and sweet and nutty, and as fresh as they could be. I sopped up the considerable oil and confit garlic left in the bowl with a couple of very good crusty rolls. 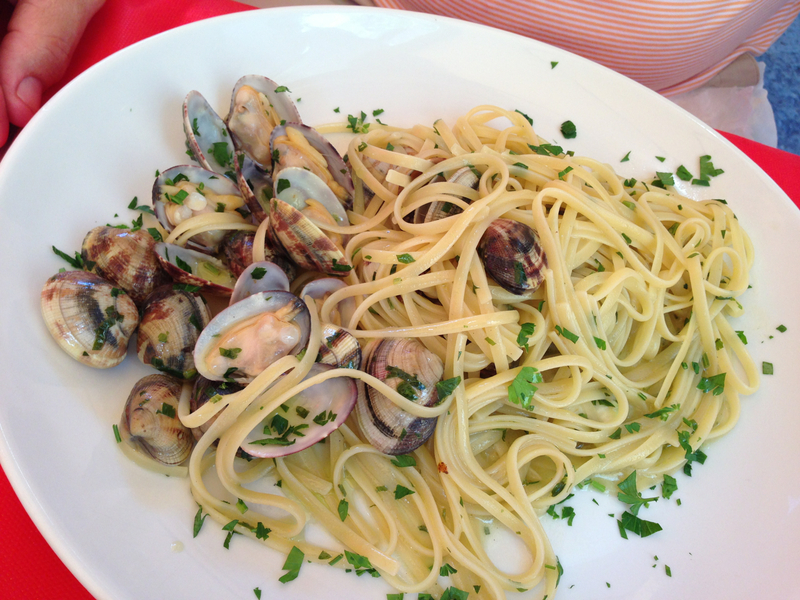 Then Jer had a plate of linguini with clams. I am not too big on mollusks but the pasta was fabulous. We had some lemon sorbetto to finish and we were all set to go when Jerry went in to ask them how they prepare the tellines he had seen in the shop — teeny tiny mollusk creatures that we have in abundance in Apalachicola. 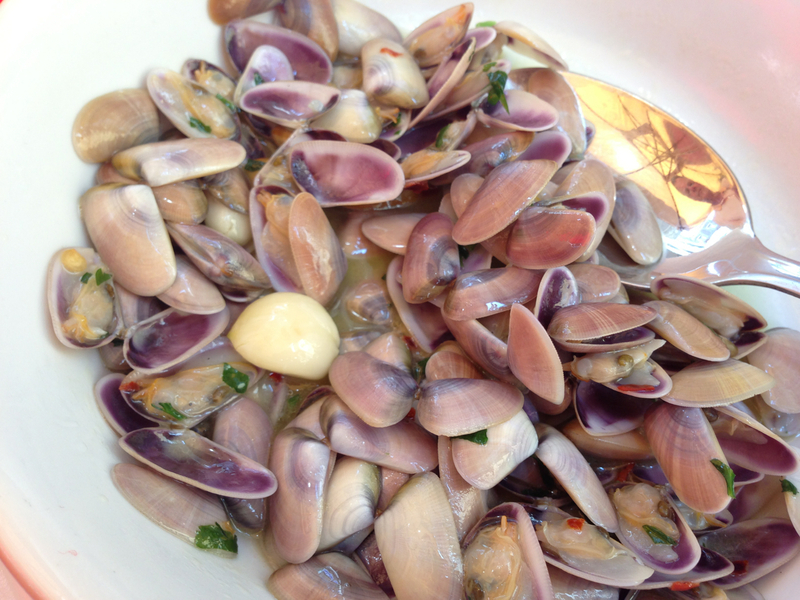 Next thing I know the owner is re-setting the table and delivering a big bowl of the little clams in garlic oil. Christine, my dad used to tell us about eating coquina soup during the depression. It was something they did only when they got really hungry, so it’s interesting to see it actually being served in a restaurant abroad.